ActivityMon Enterprise the set of tools helping managers to monitor computers and user activities on them all over the network. Its conception is based on the usage policy definition and on the set of critical events and statuses about which is manager informed. ActivityMon Enterprise allows to define acceptable computer usage policy for the group of users and/or users. Such a concept allows managers global view on their computers network and manual activities reviewing is needed any more (although ti is possible). ActivityMon Enterprise shows every potential problem with the IT infrastructure. 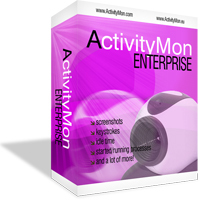 ActivityMon Enterprise product can also monitor specified computer criteria such as amount of free disk space or installed software applications on them. Licensing issues can be found this way and then handled.